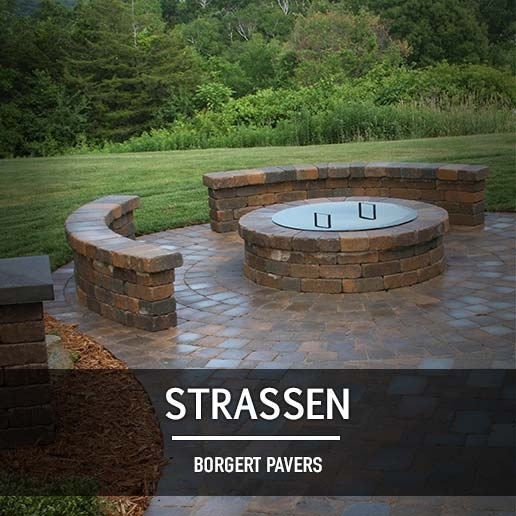 Strassen is a name that is distinguished and rich, these qualities are what make up our Strassen Classic paver. The Classic is tumbled to perfection for a softer more “weathered look”. Customers and design professionals choose Strassen Classic. The Classic is available in a palette of soft earth tone colors in three distinct sizes. You can choose any combination of sizes and colors to create a look that is unique only to you. In addition, this line comes in sizes configured to create full circles, half circles, arches or any other circular pattern. A unique feature of our circle stones is that one side is textured and the other is smooth, use whichever fits your taste. If you are partial to the “old century’s” look and feel, then Strassen Classic might be just right for your outdoor living room, entryway or driveway. As with all our paver styles, the Strassen Classic is manufactured to the highest standards of quality, ensuring you a lifetime of enjoyment. Classic Half Rectangle 4" x 6"
Size: 4 1/4" x 6 3/4" x 2 3/4"
Weight: 5.06 stones = 31.5 lbs / sq. ft.
Classic Large Rectangle 8" x 13"
Size: 8 1/4" x 13 5/8" x 2 3/4"
Weight: 1.28 stones = 31.5 lbs. / sq. ft.
Classic Rectangle 6" x 8"
Size: 6 3/4" x 8 1/4" x 2 3/4"
Weight: 2.53 stones = 31.5 lbs. / sq. ft. Weight: 2.4 stones = 31.5 lbs. / sq. ft. Weight: 2.5 stones = 31.5 lbs. / sq. ft. Colors – Boulder Blend, Flagstaff, Minnesota River.